Like the majority of our readers, the AeroGeeks team is always on the look out for products that enhance our unique athletic abilities. Admittedly we’re probably a bit obsessed with the latest and greatest gear, but we think that’s ok. With that said, we couldn’t have been more excited to receive two products we’ve been anticipating since the start of 2013—the Profile Design Aero HC and the Giro Air Attack Shield (review upcoming). We have been waiting to get our hands on the Aero HC since it was first launched at Interbike 2012. 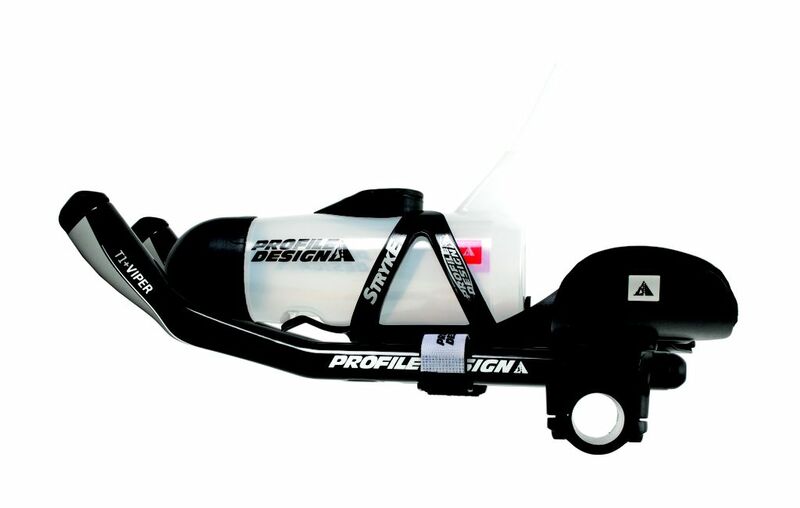 We consider the Profile Design Aero HC to be the first of the second generation of horizontal BTA products. The first generation was comprised solely of the Speedfil A2 (which we reviewed here). And while we loved the product, there were certain issues that we hope to see corrected in the next generation of products—most specifically its tendency to leak. 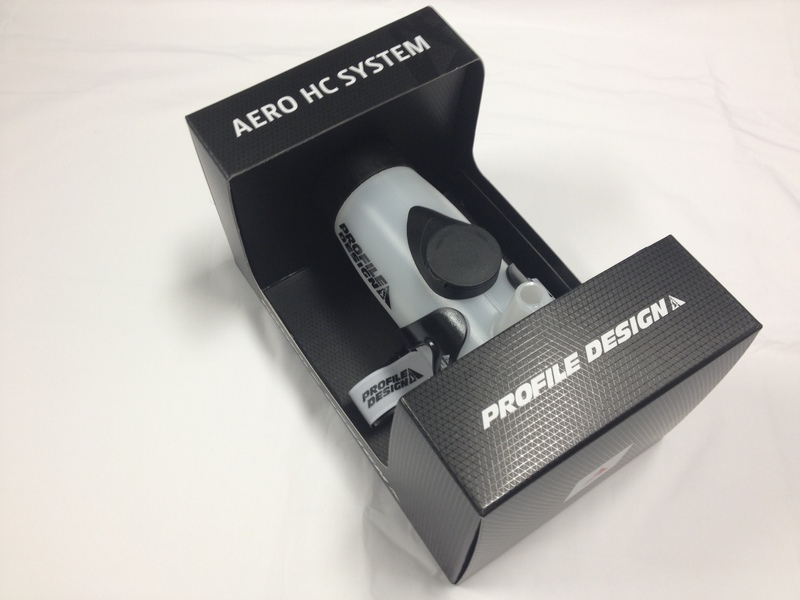 The first thing you’ll appreciate when you open the box is that the Aero HC comes with its own mount. Some may feel that including the mount forces you to pay for an additional part of the product that you may not end up using. However, after purchasing a number of other BTA products out there, we appreciated the inclusion of a mount with the total cost of the system. For many first time buyers this will help them avoid the hassle of determining what mount to choose for their shiny new bottle. 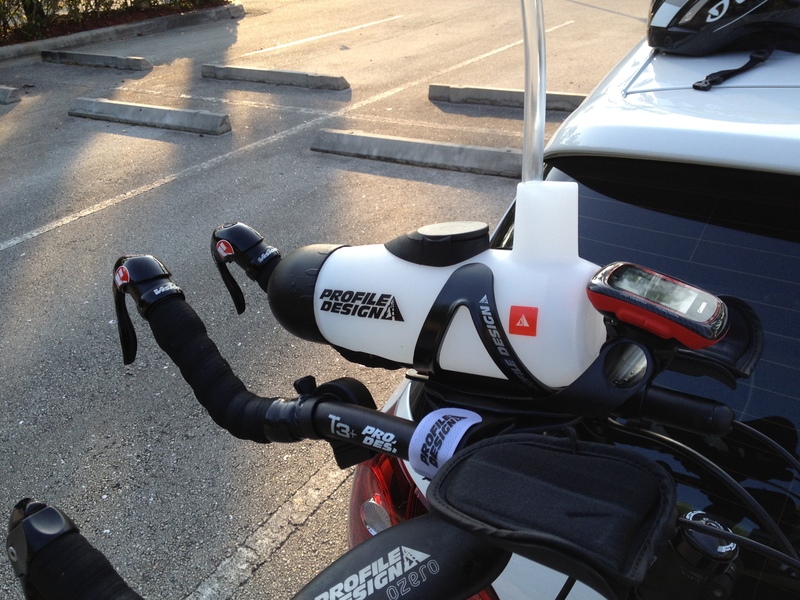 The mount utilizes a two-strap design that attaches to your aerobars. Unlike some strap-only mounts, the Aero HC mount uses two plastic half-sleeves with widths that can be lengthened or shortened based on the setup of your bars. The straps then secure the sleeves to your aerobars, which creates a very solid connection to your frame. We found that some of the strap-only connections created a bit of vibration. Fortunately we never noticed any vibration with Aero HC. The mount and included cage have special built-in notches and the bottle has corresponding slots to accept the notches. This design helps to effectively lock the bottle in place. Additionally, the mount offers an integrated computer mount behind the bottle. Sliding out from behind the bottle, this mount allows you to position your computer farther back or even to mount a larger computer. According to Profile Design, hiding the computer behind the bottle helps to clean up the airflow by using the bottle’s own aerodynamic shadow. 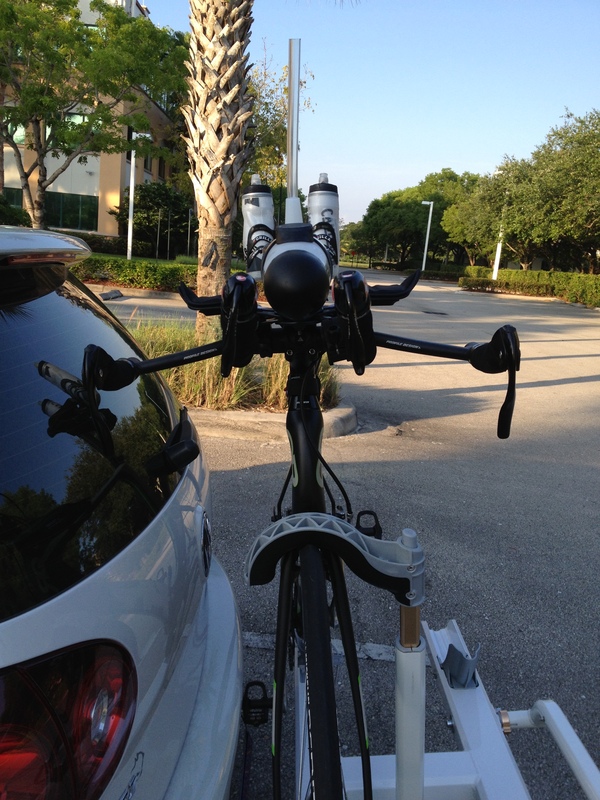 We were able to attach a Garmin Edge 500 with no issue using almost the tightest configuration. When we first saw the Aero HC bottle we couldn’t help but notice its resemblance to a submarine, with its refill port for a conning tower and a tail used to hold the straw (which is faired much like the Torhans solutions). That resemblance shouldn’t be all that surprising. After all, the structure of a submarine is designed to slice through the water as cleanly as possible. 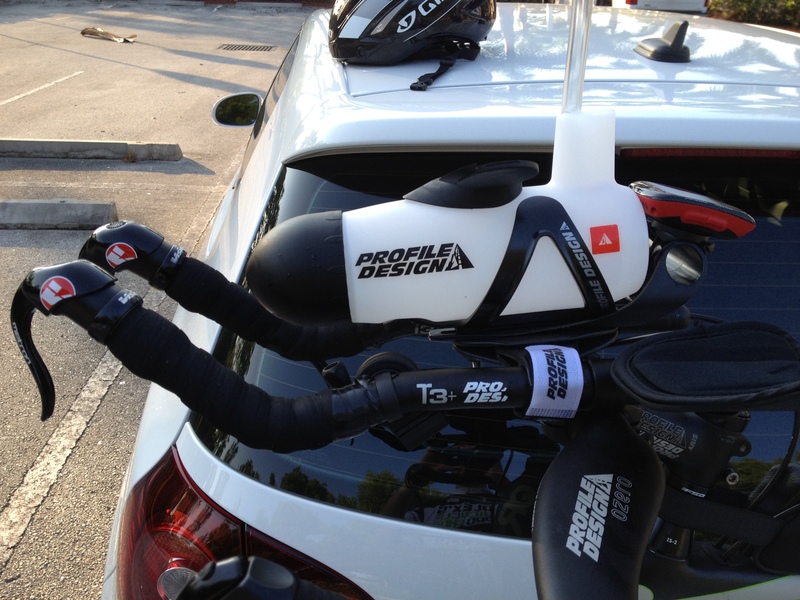 And the Aero HC bottle is designed to similarly slice through the wind. The one drawback of the design is that you are forced to use the bottle in a single orientation, while other bottles can be mounted with either a front or back orientation. The HC must have the straw mounted toward the rider. Additionally, PD has gone with a hard straw versus flexible piping (available in the A2), which means that the straw can’t be maneuvered into a drinking position [Editor:We realized it actually does come with a soft straw and for some reason it slipped our minds when we wrote this. The straw does provide a bit of give but could stand to be just a bit longer]. This prompted us to move the bottle (and mount) as far forward as possible to get the straw in a comfortable position. While this has worked well for us, it does mean the computer has to be used with the included mount rather than positioned in front of the bottle. The bottle holds 28oz of liquid, which is right up with there with the Torhans Aero 30 for one of the largest capacity BTA setup’s available (also eclipsing the onboard capacity of the Shiv). We typically use a Camelback 25oz bottle to store the contents for the BTA bottle on the drive to our rides. However, the HC’s larger capacity requires us to bring a second bottle to top off. And with steamy days in store for us here in South Florida, we cannot over emphasize the importance of extra liquid on our long rides. Like most other BTA products out there, the Aero HC includes an integrated refill port. In our initial testing of the port we experienced very little spillage while open and virtually none while closed. And when you do need to clean the bottle, simply remove the nose for easy cleanup. The bottle is also dishwasher safe. Unlike many other BTA bottles, we are happy to report little evidence of leakage. In fact, we saw no leakage at all after leaving the bottle full on the bike for nearly an hour. And on the ride we saw only minor leakage during the refill process. It’s true that the refill port may not be as advanced as some others out there. However, since the opening is quite small, we have actually experienced less splash back with the HC than with other bottles on the market. We find that the mount is a smartly designed product—using the straps in conjunction with solid plastic sleeves leads to a strong connection with the bike. The one thing we would like to see here is the ability to slide the cage independently of the mount. 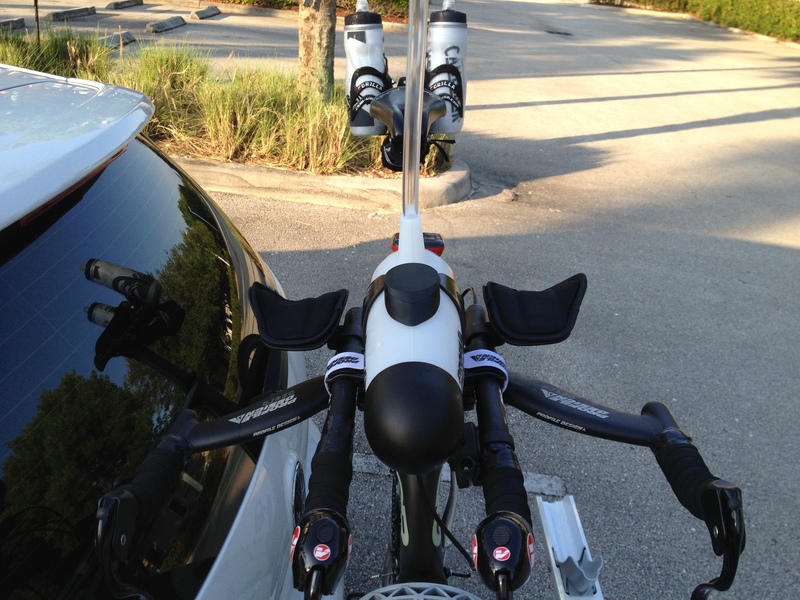 This is because some users may find that the perfect place to fit the bottle requires the straps to be exactly where the aerobars mount to the basebar. Something simple like lengthening the holes on the cage could solve this. After just over a week we’re already starting to get a feel for this bottle. We plan to continue riding with the bottle to test its performance in harsher conditions. We want to see if the bottle remains leak free and launch proof. We also plan to swap out the solid plastic straw for a flexible solution to see if that helps solve some of the fit issues we’ve experienced. As always, we’re here to answer your questions. So let us know if there’s anything you’d like us to explore further in our testing. Thanks for reading AeroGeeks. We don’t have an 810 handy but we do have a 510 (with the silicone skin) and it did fit. There was not an extreme amount of room to spare but it fit with a small amount of clearance. We will make sure to include pics in our final thoughts column. 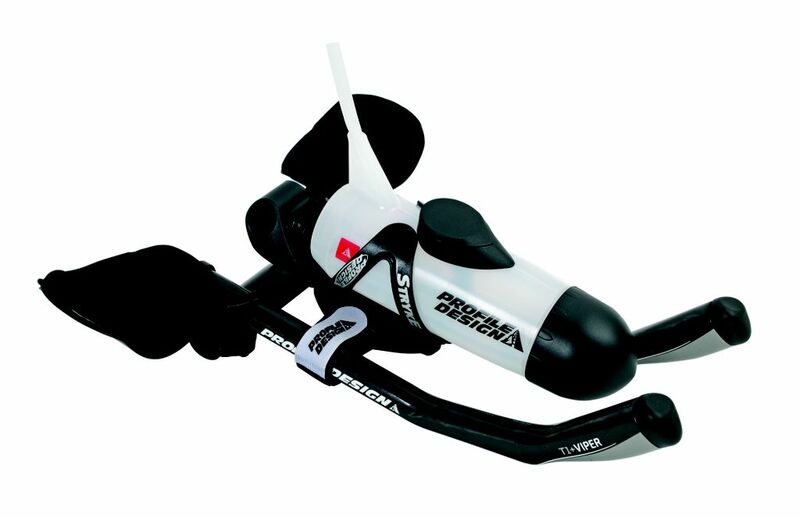 How well does that work for smaller riders with shorter aerobars? Again, the straw placement seems like it would be much more problematic. Unfortunately all of our editors are over 5’9″ so it may be tough for us to say exactly how it works with smaller riders with shorter aerobars. However one of the things we have tested is pushing the Aero HC fairly far back in the bars. What we have found is that the straw is flexible (something we had made a mistake about in our original article) and can be positioned which might be a solution for you. However the straw is a bit on the short side and for a shorter rider what you may want to consider is getting a bit of extra flexible piping and using a longer straw. How easy is it to use the computer waaaay back there?? This is a question we have gotten a few times, and will be covering in our final thoughts article. What we have found is that if we push the Aero HC as forward as possible, it is actually quite easy to read the computer. The additional benefit is that it moves the straw into a more easily accessed position. Unfortunately riders with shorter forearms my find this a bit difficult since slamming the bottle forward may interfere with the positions of their hands.